I couldn't help picking up a few additions to my stash this week. 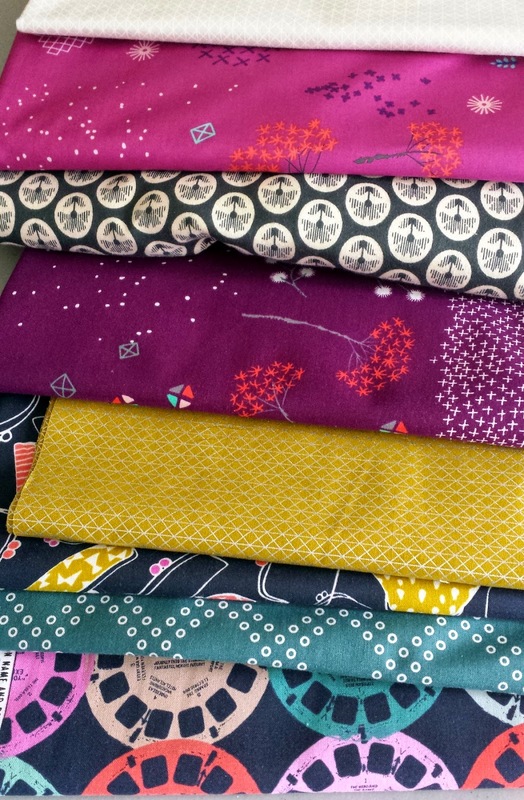 As with most purchases, I tend to buy larger cuts (half yards) of fabrics I like, versus buying a whole fabric line in fat quarters (unless I really, truly plan on using/really love the whole thing). It's just like buying music; I rarely buy an entire album and instead just invest in one or two songs. Unless it's Coldplay... because I eternally love them. Anyway, in terms of Cotton and Steel, I really gravitate towards Rashida Coleman Hale's color and print choices - and her Mochi line is a huge winner in my book. I don't really see myself using many of the other prints in the new release (from the other four designers). I usually buy and use "helpful" fabrics; according to Rachel of Stitched in Color, these are mostly simple, one color prints (or those that are peppered with white, like Pearl Bracelets, Bike Path, that second fabric from the bottom on my stack above, etc.). I constantly mix fabric lines without shame and don't really feel loyal to any largely multicolored fabrics (except Anna Maria Horner's). As a result, I'm still building up my Cotton and Steel Basics (I usually buy a half yard or a yard), and Netorious is by far my favorite and most used Basic (you're probably tired of hearing this from me!). This time, I bought the white and gold. The dark blue Viewfinders from Melody Miller were hard to pass up, and the purses from Mochi (yes, I realize they are multicolored - but they are so awesome!). I bought a yard of that purple Mochi print with the trees to use for a purse (probably - and just to hoard, because it's a perfect shade of purple). I bought the Mochi Lawn print for a dress, but it's more pink than I imagined from online. Oh well. We'll see. And I snuck that Anna Maria Horner knit into my order (third fabric from the top) for a shirt. I'm in such a garment-making craze right now (though there are no promises that it will continue! I just go by what I feel like making)! 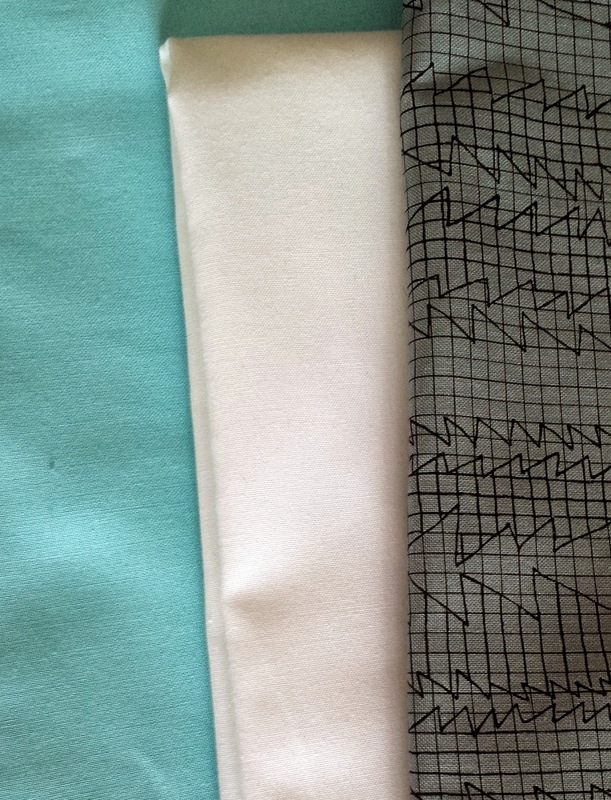 Then, I picked up some much needed solids from Pennington Quilt Works, my (kind of local) quilt shop, yesterday. I was in the area for a lecture/trunk show by Cloud 9 Fabrics, which I set up for our guild. I hope to blog about it sometime this week. Anyway, I needed the solids (I know the white is Kona but I don't remember the blue) for my Sisterhood of the Traveling Quilts starter. I need to get it started (today? maybe?) because I'm handing it over in AUSTIN IN 18 DAYS!!! What?! How is it February already? Oh, and I couldn't help picking up a half yard of that beautiful Doe print. I plan on buying a few prints from Doe (the orange one, the all blue one, and some of the whites) at some point. What have you been stashing? Great stuff. That viewfinder fabric is in my new fabric pile as well. I think I'll be using some of it to make a bag or pouch. I love your fabric choices! I can't wait to pick up some of the new cotton and steel prints, and I must admit that I bought a half yard of the grey Doe print, used it within a couple days, then purchased two more yards. It is a great midtone grey. 18 days is giving me heart palpitations!! I want to finish the medallion quilt, a mini quilt to swap at QC, a dress and my sisterhood start! Your fabrics are so pretty! I bought a bunch from Hawthorne last week, and I'm the same way--I pick and choose only the fabrics I love from a line and then get a half yard so I can use them a lot! I got two from Tokyo Train ride--the insects and octopus of course. . I have a Hawthorne Threads order I need to place. I want to give the Marsala quilt challenge a go, that is going to be tough but hopefully fun for me. I am definitely craving several prints in the Doe line... 18 days? Eek!